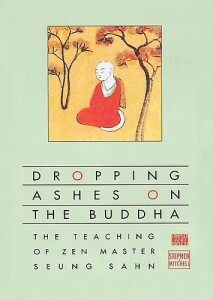 Dropping Ashes on the Buddha has become a classic guide for Zen students. Like much of Zen literature, it is a record of a Zen master’s way with his students. What makes this book unique, however, is that when it was written Master Seung Sahn is very much alive, that his students were young Americans, and that the dialogues set down here took place in the United States. Thus, for the first time, the kong-an [koan] method may be seen applied within a thoroughly modern context. 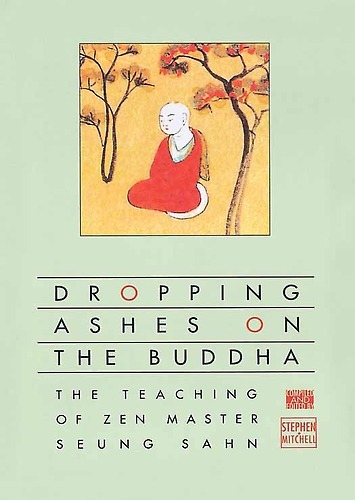 Consisting of dialogues, stories, formal Zen interviews, Dharma speeches, and letters using the Zen Master’s actual words in spontaneous, living interaction with his students, Dropping Ashes on the Buddha is a fresh presentation of the Zen teaching that leads to an understanding of ultimate reality. Soen-sa said, “Four blind men went to the zoo and visited the elephant. One blind man touched its side and said, ‘The elephant is like a wall.’ The next blind man touched its trunk and said, ‘The elephant is like a snake.’ The next blind man touched its leg and said, ‘The elephant is like a column.’ The last blind man touched its tail and said, ‘The elephant is like a broom.’ Then the four blind men started to fight, each one believing that his opinion was the right one. Each only un-derstood the part he had touched; none of them understood the whole. In your letter, you said that you have read many books about Zen. That’s good. But if you are thinking, you can’t understand Zen. Anything that can be written in a book, anything that can be said—all this is thinking. If you are thinking, then all Zen books, all Buddhist sutras, all Bibles are demons’ words. But if you read with a mind that has cut off all thinking, then Zen books, sutras, and Bibles are all the truth. So is the barking of a dog or the crowing of a rooster: all things are teaching you at every moment, and these sounds are even better teaching than Zen books. So Zen is keeping the mind which is before thinking. Sciences and academic studies are after thinking. We must return to be-fore thinking. Then we will attain our true.self. In your letter you said that your practice has been count-ing exhalations to ten. This method is not good, not bad. It is possible to practice in this way when you are sitting. But when you are driving, when you are talking, when you are watching television, when you are playing tennis—how is it possible to count your breaths then? Sitting is only a small part of practicing Zen. The true meaning of sitting Zen is to cut off all thinking and to keep not-moving mind. So I ask you: What are you? You don’t know; there is only “I don’t know.” Always keep this don’t-know mind. When this don’t-know mind becomes clear, then you will understand. So if you keep don’t-know mind when you are driving, this is driving Zen. If you keep it when you are talking, this is talking Zen. If you keep it when you are watching television, this is television Zen. You must keep don’t-know mind always and everywhere. This is the true practice of Zen. if you do not make distinctions. So throw away all opinions, all likes and dislikes, and only keep the mind that doesn’t know. This is very important. Don’t-know mind is the mind that cuts off all thinking. When all thinking has been cut off, you become empty mind. This is before thinking. Your before-thinking mind, my be-fore-thinking mind, all people’s before-thinking minds are the same. This is your substance. Your substance, my sub-stance, and the substance of the whole universe become one. So the tree, the mountain, the cloud, and you become one. Then I ask you: Are the mountain and you the same or different? If you say “the same,” I will hit you thirty times. If you say “different,” I will still hit you thirty times. Why? The mind that becomes one with the universe is before thinking. Before thinking there are no words. “Same” and “different” are opposites words; they are from the mind that separates all things. That is why I will hit you if you say either one. So what would be a good answer? If you don’t understand, only keep don’t-know mind for a while, and you will soon have a good answer. If you do, please send it to me. You asked why I use words to teach, if understanding through words is impossible. Words are not necessary. But they.are very necessary. If you are attached to words,you cannot return to your true self. If you are not attached to words, soon you will attain enlightenment. So if you are thinking, words are very bad. But if you are not thinking, all words and all things that you can see or hear or smell or taste or touch will help you. So it is very important for you to cut off your thinking and your attachment to words. Jo-ju said the dog has no Buddha-nature. Clouds float up to the sky.